Half Brother by Kenneth Oppel. Grades 6-9. Scholastic Press, September 2010. Reviewed from ARC provided by publisher. When Ben moves across Canada with his family for his father's new job, everything is new - new house, new school, new friends, new car... But strangest of all is the new addition to the family - a chimpanzee named Zan. The chimp is part of his father's latest academic experiment. Ben's father aims to prove that chimps are capable of learning language and his mother is studying cross-fostering - one species being raised by a d different species - which means Zan has become a part of their family. A half brother, if you will. At first, Ben's not sure how he feels about the experiment, but as he gets to know Zan he comes to care about him and soon feels like he's one of the family. But what will happen to Zan when the experiment is over? Rife with details that bring the 1973 setting to life, this book will definitely give middle-school animal lovers something to think about. The cover and subject of the book will have kids picking it up and they'll find an engaging story with no easy answers. The story is about Ben's relationship with Zan, but beyond that it's about Ben's relationship with his entire family, especially his father. As Ben struggles to find his way in a new school, he patterns his behavior with the theory that acting like an alpha male will make him an alpha male. He has some success with this among his peers, but when it comes to his father, it's a whole different ball game. Ben is longing for acceptance, but his father seems to care more about his own career than about his son. I really like the way Mr. Oppel deals with Ben's relationships because he delves into Ben's emotions in a guy-friendly way. I think this is a story that a lot of middle-school guys will relate to. I loved Kenneth Oppel's previous works of fantasy and this is something very different, but I loved this story, too. 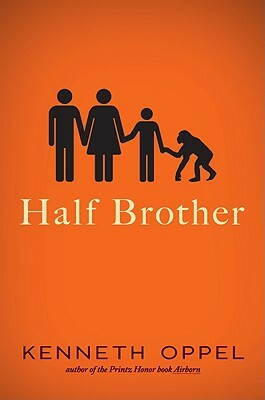 Kids who were fascinated by Joey's friendship with Sukari the chimp in Ginny Rorby's Hurt Go Happy will want to check out Half Brother for its subject matter. Kids who relate to the guy characters in Jordan Sonnenblick's titles will want to check out Half Brother for its realistic portrayal of a guy dealing with feelings (though Half Brother has a more serious tone than Sonnenblick's works). Half Brother will be on shelves September 1.